Gathering around the dining room table to play board games with friends and family is a common pastime for many people. In the past, board games were something to be played during family gatherings. More recently, the introduction of Euro-games, such as Settlers of Catan, has made adult game-playing extremely popular. Many players are drawn to the social atmosphere provided by the face-to-face environment of tabletop gameplay. However, there are several drawbacks to these types of board games. Setting up a game came be time consuming, especially for complex strategy games. Moreover, these games can take many hours to play, and often are played over several sessions, requiring a dedicated space to house the game and game state between play sessions. 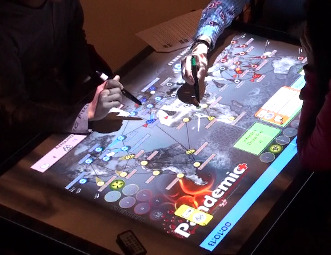 Digital tabletop computers provide an interesting opportunity to reduce some of these drawbacks, while maintaining the social, face-to-face environment not typically offered by standard computing gaming platforms. 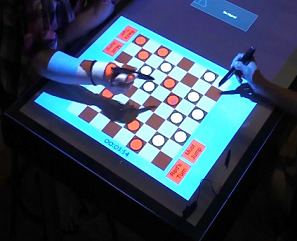 Moreover, the tabletop computers provide several opportunities to introduce new gaming genres unlike either traditional board games or traditional computer games. The aim of this project is to investigate user interface design issues related to converting traditional board games to a digital tabletop format, and to investigate new possible gaming genres enabled by the unique capabilities of a digital tabletop computing platform. James R. Wallace, Joseph Pape, Y-L. Betty Chang, Phillip J. McClelland, T.C. Nicholas Graham, Stacey D. Scott, and Mark Hancock. 2012. Exploring automation in digital tabletop board games. In Proceedings of the ACM 2012 Conference on Computer Supported Cooperative Work Companion (CSCW ’12). ACM, New York, NY, USA, 231-234. Joseph Pape, (2012). The Effects of Digitization and Automation on Board Games for Digital Tabletops, MSc Thesis, Queen’s University, 2012. Ashley Kelly, James Wallace, Katherine Cerar, Neil Randall, Phillip McClelland, Amanda Seto, Stacey Scott: Solar Scramble: an Educational Children’s Game for Collaborative Multi-touch Digital Tabletops, In Proceedings of ACM International Conference on Design of Communication (SIGDOC), ACM Press, 2010.